I reckon you're overlooking quite a powerful piece of your commander. You can exile creatures from ANYONE'S graveyard! Fair enough, I threw it together as the first idea I had that met the requirements and I'd enjoy playing. 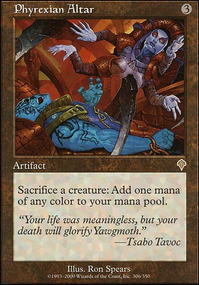 I'm currently tinkering with an Inverter of Truth/Enduring Renewal list using it because it felt more fun. Still, am a little weired out by the choice of Lay Bare the Heart over Delirium Skeins or Duress. Reasoning? Primal Amulet Flip x3 is just too much: You don't want to have 2 in your hand / in the game and it's too slow. I would go with 1x. Phyrexian Scriptures is a 4 cost board / graveyard wipe and I would suggest using 4 of those as well, these won me almost every game so far. 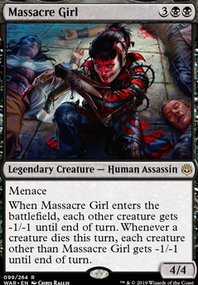 What's awesome about it is that it has a 1 turn delay which means your opponent can't play any creatures that turn and you can chain them if you draw multiple. Sideboard it for Divest vs artifact decks. Hey, PhineasMTGMaster - cool idea. Have you looked at decl lists like 8-Rack? There are a lot of cool discard-themed decks out there, including Hollow One and Dredge, depending on whether or not you want to discard or make your opponent discard. 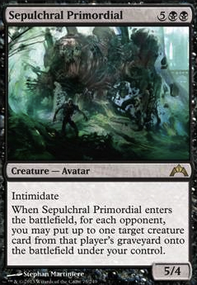 Even Jund depends on a lot of disruption. 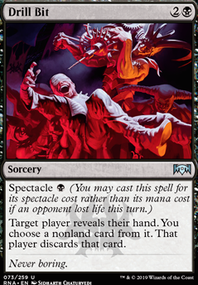 However, a lot of popular discard or disruption decks include costly cards like Liliana of the Veil. My concern here is that your mana costs are too high to let you play enough creatures to win or enough disruption to keep your opponent from winning in Modern. More black, less blue, and fewer creatures might help. Here, I think you can lower your mana curve (and then re-tool your mana-base), keep costs down, and have a lot of fun. With a bigger budget, you can improve the mana base, get better disruption (e.g. Inquisition of Kozilek), or explore a full list of a discard archetype like 8-Rack. I love that you can completely shut your opponent down right away with all these discard cards. Tormented Soul doesn't seem very good here though. I also wouldn't run Dark Deal since you don't want to lose too much of your own cards. 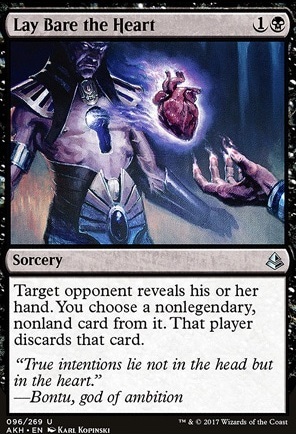 It might be better to go for some more low mana discard cards like Divest and Lay Bare the Heart. You should definitely run Guul Draz Specter, that would be a great alternate wincondition in this deck. Shrieking Affliction could be of great help as well. Some other discard cards that could work (but might be too expensive or not useful because you can empty your opponents hand pretty quickly already) are Scepter of Fugue and Mind Shatter. I like the BG -1/-1 counters theme!But to make it better, 4 of the previously channeler suggestion is necessary. As is 4 Hapatra, the best thing since slied bread for this deck. The other big payoffs are 4 of Nest of Scarabs and 4 Obelisk Spider. Next, you will need enablers - 4 of the crocodile, ammit eternal, beetle and 4 Exemplar of Strength. The other 8 flex slots can be some removal in the form of Banewhip Punisher, Lethal Sting or some recursion for cards like Gravedigger or some discard like Lay Bare the Heart.